This is a Guide to Copenhagen. 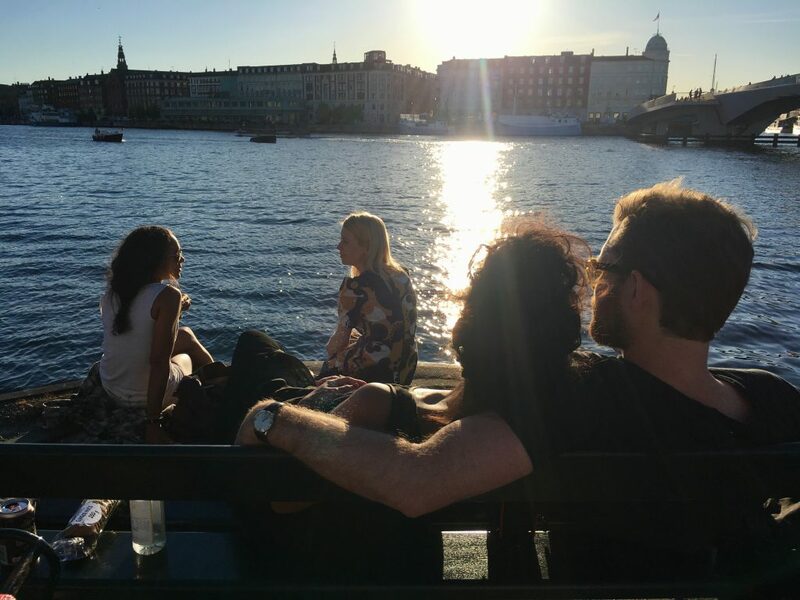 It is my take on how you should spend your time in Copenhagen. – everything in Google Maps. I am 43 years old. I live in Nørrebro, Copenhagen. I am the maker of a startup called Stuff.li. I spend a lot of time in the city – day and night. Food, music and “slow living” are probably my favourites activities. Feel free to reach out to me on Twitter if you have any questions @simonschultz. It will take 20-30 minutes to get from the airport to central Copenhagen. A taxi will set you back about $50. You find the taxis on the right side just after customs. Alternatives are trains or the Metro. You find both by walking straight ahead after customs. Take the train, if you are going to Copenhagen Central Station. Take the Metro (up the stairs), if you are getting off at Christianshavn, Kgs. Nytorv or Nørreport. You could come prepared by downloading the ticket application. Alternatively just get the tickets on you right side just before the stairs to the Metro. As long as you are staying in Copenhagen K (central, but touristy), Vesterbro (hip), Inner Nørrebro (diverse) or Inner Frederiksberg (families) you can get anywhere riding a bike in 25 minutes. 71 Nyhavn Hotel – Absolute great location round the corner from Nyhavn. Also, harbour view. Nobis Copenhagen – Newest hip luxury hotel close to Tivoli Gardens. Axel Guldsmeden – Cosy, great quality and the centre of Vesterbro. Manon Les Suites Guldsmeden – fairly new. Beautiful courtyard. Admiral Hotel – Great location, traditional. Quite a lot of rooms – but harbour view. 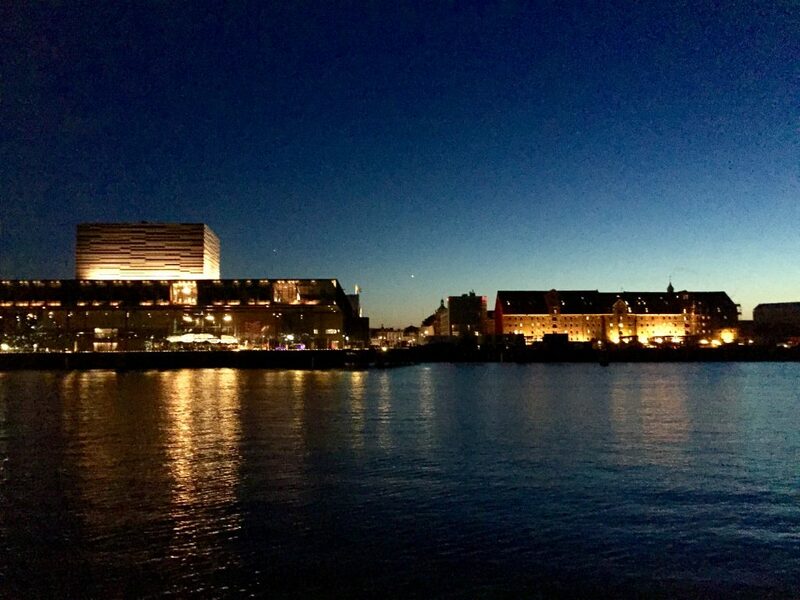 Wakeup Copenhagen – A comfortable bed and perfect location on a budget. Fancy really luxurious hotels? Check out either Hotel d’Angleterre or Hotel Nimb or Hotel Sanders. Room with a view – 71 Nyhavn Hotel. Copenhagen has a bunch of great restaurants. I would eat at any of the following restaurants again any day. Expect a really laidback atmosphere. Don’t expect a tablecloth and no need to dress up. But always (!) book a table. Also, don’t expect to be served, if you just swing by a restaurant after 10:00 pm. Not just really good food. Also a great atmosphere and talkative Copenhageners. Kind of prioritized if you can’t decide on where to go. Barr – Where Noma used to be located. A lot of beer. And really really great food. Cantina – shared dishes. Great pizzas and cocktails. Stay for more cocktails after your dinner. Pluto – Good vibe, where the cool kids hang. Great shared dishes. Located in the centre. Bæst – Nørrebro, same style as Cantina, Gorilla and Pluto. Italian food. Aim for the menu. Fiskebaren – Fish restaurant in Meatpacking. Also, great drinks and a vibe/scene. Gorilla – Same as Pluto, just located in the Meatpacking district. Llama – South american food. Award-winning design. Stay for the drinks and dance. You could as well just go here for the drinks and the dance. Restaurant Mes – Mes and Meille are my two newest favourites. More classic restaurants. Great for date night. Fairly cheap. New nordic. Great service. Restaurant Meille – See Mes, above. Pastis – Classic french bistro. New Yorkers will get a flashback to the now-defunct Pastis in NYC. Geist – Bit too “polished” for me. But food is great. Try to get seated by the bar. If you are coming for the good food, but a more down-to-earth local vibe. Falernum – wine bar and good selection of food in the super charming street Værnedamsvej. Manfreds – Quote: “(probably) the world’s only veggie-focused restaurant famous for its raw meat”. Osteria 16 – Italian. One simple menu. Five servings. Cheap. Sitting close. Food might be served on plastic dishes. Bevi Bevi – Just like Osteria 16. Also in Vesterbro. Anarki – A bit off the beaten track in Frederiksberg. Great service. 20A – Super local if you are in Nørrebro. Fish, Meat or some sort of a shared platter. A couple of really local/cosy places to hang afterwards (Kind of Blue, Barking Dog, Brus). Gro Spiseri – For that really special rooftop kitchen garden experience. To be booked well in advance – if you are lucky. Pate Pate – Wine bar and good food in Meatpacking. La Banchina – For the simple food and lazy drinks in the sun. Bicycle required. Expect to eat your food sitting on the dock. Serving a great set 5-8 course menu when season is for indoors hygge. Jah Izakaya & Sake Bar – Japanese food, izakaya, sake bar, natural wines and Jah Beer. Close to meatpacking. If you are aiming for Michelin food you have probably already heard about the two best ones Noma (currently no stars, just relaunched) and Geranium (***). AOC (**) – my favourite after Geranium. Kadeau (*) – great guys, but expensive. Kiin Kiin (*) – asian and completely different from the “new nordic” kitchens. Relæ (*) – mainly organic and biodynamic wines. Amass (Close-to-Michelin) , but just awesome. Probably hip-hop as your dinner soundtrack. Kick things off with a drink in their harbour-view kitchen garden. I would categorise 108, Clou and Formel B as “trivial” for Michelin restaurants. If you are into sushi – just go for one of the many Sticks N Sushi. Aiming for a steak frites. Go for one of the Retour Steak restaurants. Pre-drinks in the kitchen garden of Restaurant Amass. Breakfasts are best enjoyed in the sun. Original Coffee – Located all over the city. Preferably the one in Sortedammen. Their 55 kr. Morgenkomplet is a nice way to start the day. Wulff & Konstali – I am biased and godfather of the owner’s 2 kids. The city’s best brunch. Chinese tourists are flocking to the one in Lergravsvej – also to visit the beach. You should probably just aim for the one on Skt. Hans Torv in Nørrebro. 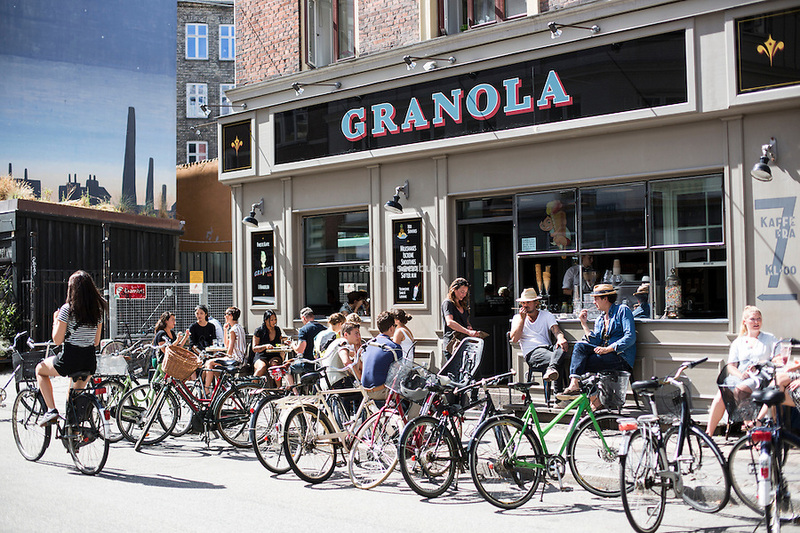 Granola – Local vibe in cosy Værnedamsvej, Vesterbro. Lagkagehuset – A bunch of bakeries, if you just want to grab something to go. Aim for a traditional Danish lunch at one of the following places. Should be enjoyed with both draught beers and schnapps. Book a table in advance. Palægade – a high-end favourite. Taking a 2019 approach to the old traditions. Lunch in the sun could be enjoyed in Nyhavn if you don’t find it too touristy. Would suggest Havfruen, then. La Banchina, Tolboden or Hija de Sanchez by Torvehallerne are other great places for lunch in the sun. 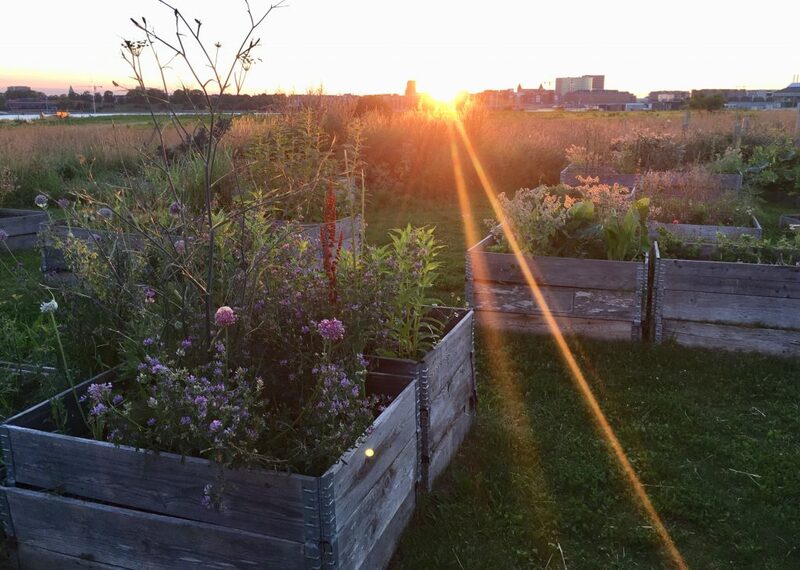 Reffen is the newest Streetfood Market, with an amazing view of Copenhagen harbour. You should go – no matter what – in the summer if the sun is shining. A bunch of good food, different events and workshops. Good for both lunch and dinner during the summer. Combining dinner and drinks are best done at Llama, Pluto, Gorilla and Cantina, see above. Brønnum – Reservations is required. Next to Nyhavn and the National Theatre. Lidkøb – Vesterbro, The “hidden” whiskey bar on the 3rd floor only opens on busy nights. Duck & Cover – Vesterbro. 70s living room vibe in a basement. Good for a slow date night. Mudhoney – a small local favourite in Nørrebro. Also good for breakfast. Ruby’s – Good cocktails. But seems to be bankers hangout spot. Balthazar – If you are all in on fancy Champagne and celebs. It is all about the conversations. The beers. and the dice games. Ask nicely and you can join the simple dice games. Rules are explained in 2 minutes. Palæ Bar – My favourite. Chances are that you can find me here quite often. Byens Kro – Smoking allowed. Borger Kroen – younger crowd. Kind of Blue – Not really a dive bar. But laid-back. Where I usually play my chess games in Nørrebro. 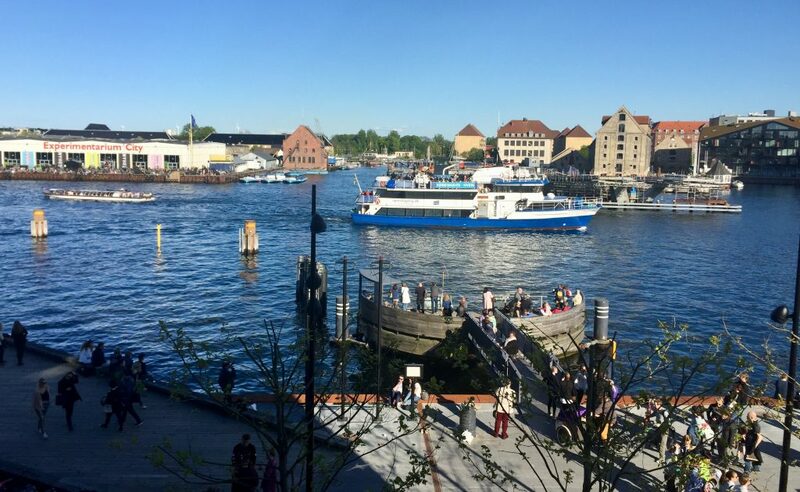 Ved Stranden 10 – Wine bar by the canal, if you want you rosé in the sun from 1 pm. City’s absolute best spot for afternoon rosé. Brus – Great beer bar in Nørrebro. La Fontaine – Cosy jazz bar. Lots of music. Mikkeller – If you are a beer fan, you probably already know about the Mikkeller Beer Bars. I am not a fan. I appreciate regular pilsner beer. Kayak Bar – laid back “beach bar” by the harbour. You could as well rent a kayak. If you are more in a clubbing kind of mood. Royal Danish Playhouse and Admiral Hotel. Ride a bike. Eat Food. Drink Beer. Amalienborg Castle – the Royal family’s home. Change of guards at noon. Kastellet – a nice walk around the old fort. King’s Garden – garden in the city center – including the Rosenberg Castle. National Gallery of Denmark – nice museum mixing old and new. Tivoli Gardens – the old amusement park in the centre of the city. A couple of good places to eat as well. Large concerts every Friday night. Nyhavn – resturants, boats and really picturesque (and touristy) – eat at Havfruen. 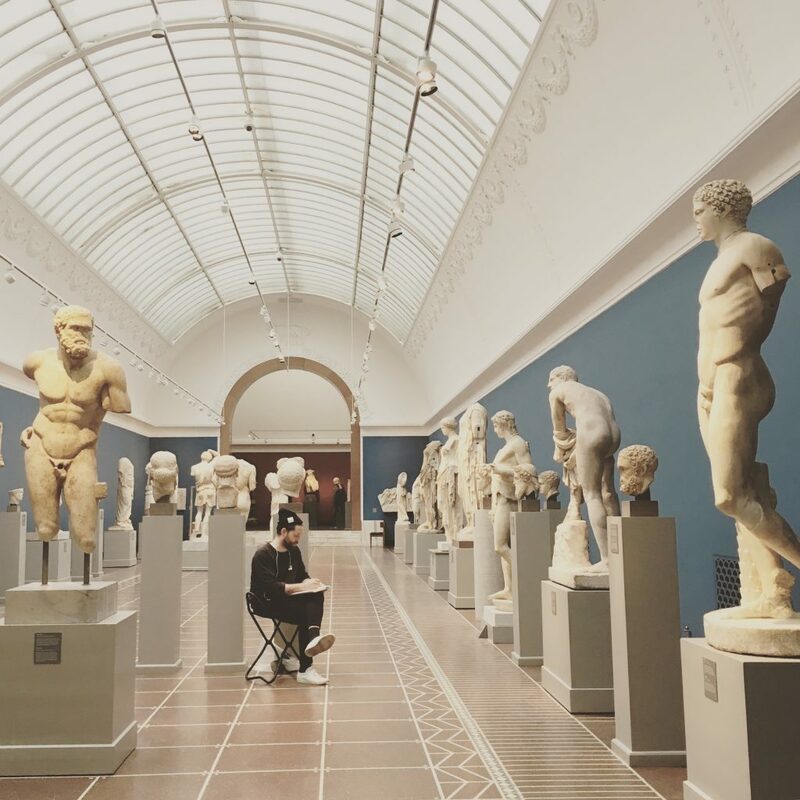 Glyptoteket Museum – really nice surroundings displaying ancient and modern art. Canal Tours – Departing from Nyhavn or Ved Stranden all the time. Go Boat – alternative to the regular tour boats. Rent your own small electrical-powered boat to cruise the harbour. Bring enough rosé, beers and snacks. Freetown Christiania – self-proclaimed autonomous anarchist district. Not as friendly as it used to be. Our Saviour’s Church – If you are in Christianshavn / Our Saviours Church I would spend the time climbing the spire of Our Saviour’s Church. Great view. Torvehallerne – Food, food, food and food. For breakfast, lunch, snacks and drinks in the sun. Assistens Cemetery – Old cemetery in Nørrebro, You will find Hans Christian Andersen and Kierkegaard’s graves surrounded by locals having picnics in the sun. The Harbour Bath – Bring your swim gear and take a swim in the harbour 24/24h. The Cisterns – a former water reservoir turned into a museum. Frederiksberg Have – if you are into gardens/parks. Go say “hi” to the elephants. – forget about The Little Mermaid – here’s a picture of her. If you feel like leaving the city for a day (by train/car), I would go to Louisiana Museum of Modern Art – amazing museum with great garden and sea view. Restaurant is good. Followed by Frederiksborg Castle and Garden in Hillerød. 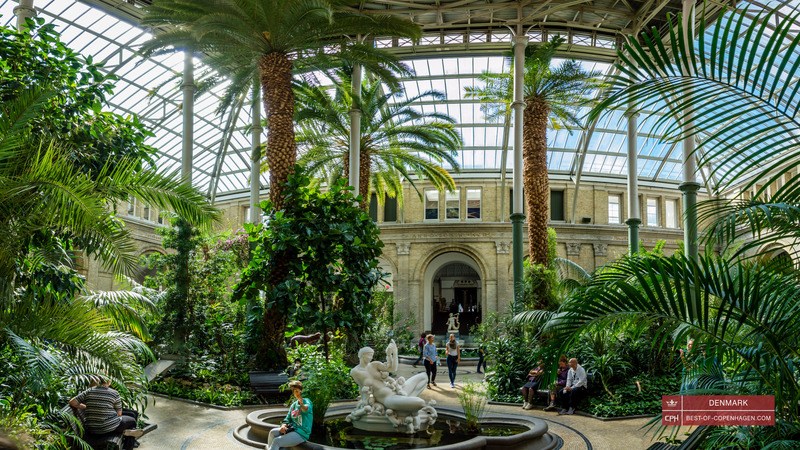 Glyptoteket – the palm garden is a good place for cake and coffee. You should really experience Copenhagen by bike. Really. Bike lanes are wide and bikers are fairly slow compared to bikers in London or New York. Stick to a few tricks like: Keep right. Use hand gestures. Ride in a straight line. Then you are all set. A good link to other tips for cycling in Copenhagen. Many larger hotels have bicycles for loan or rent. Bycykel – The official electrical city bike – more expensive and the need to be docked in a limited amount of docking stations. Donkey Republic – Orange bikes available everywhere. Can be unlocked through an app. Pickup and leave bike where ever it fits you. Smaller bicycle shops also rent out bikes. Even though Copenhagen should be experienced on a bicycle, there are a couple of great walks, that are not suitable for riding a bike – eg. parks, promenades and shopping streets. See map for details and suggestions for walks and bike rides. A beer on a bench – across the small bridge from Nyhavn. Everything has been thrown into this map. Coloured and categorised related to the above groups of suggestions. A direct link to the map. Do not (!) walk in the bike lanes. It compares to walking on the highway.